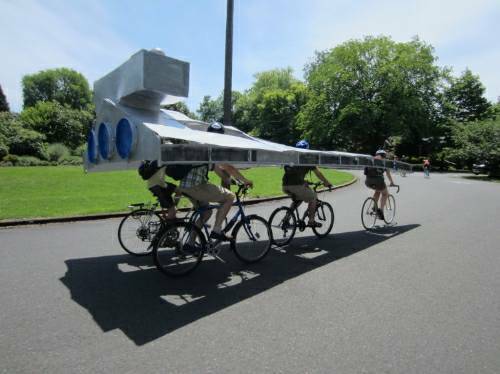 Some lucky residents of Portland, Oregon are in for a treat, because there is a custom-made, bike-powered, 22-foot-long Imperial I-class Star Destroyer parade float currently available for free on Craigslist. 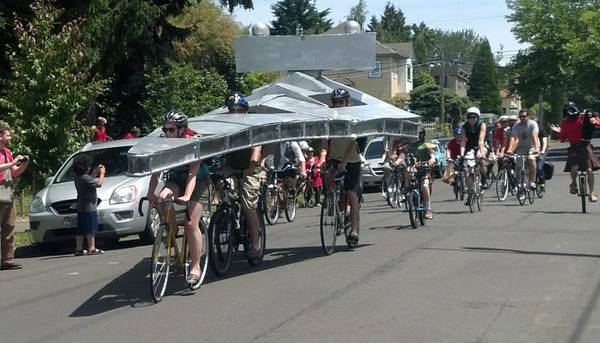 The Star Wars-themed float fits in a standard road lane and requires four bicyclists to operate it. Personally, I think that you'd have to be some kind of moron to yoke yourself neck-to-neck with three other bikers, any of which could plunge you asphalt-ward to a paralysis-inducing neck injury. Spaceship is bike powered; it does not actually fly.